If you haven’t yet heard about this wonderful book by Author Richelle Mead, be sure to check out all the details below. This blitz also includes a giveaway for a signed copy of the book and a $25 Sephora Gift Card courtesy of Richelle, Penguin Teen, and Rockstar Book Tours. So if you’d like a chance to win, enter in the Rafflecopter at the bottom of this post. leave readers on the edge of their seats until the very end." destiny, and adventure in an unspoiled, prosperous new land across the sea. though she’s falling in love with him. possibly lead them to their deaths. 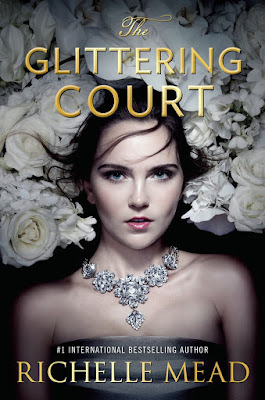 will receive a hardcover of THE GLITTERING COURT & a $25 Sephora Gift Card. By far, my favorite cover to date. And I CANNOT WAIT TO READ THIS BOOK! I am already hearing some truly amazing things about it, and I can't wait to experience it for myself! Thank you so much for the giveaway, and for reading my exclamation point heavy comment!! !